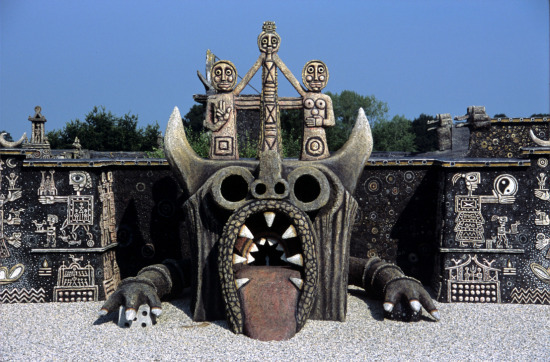 ROBERT TATIN'S MUSEUM IN A SURREALIST SELF-BUILT COURTYARD, COSSE LE VIVIEN, FRANCE - Строитель все о Строительстве, Архитектуре, Ремонте, Дизайне! Стройка от А до Я! От идеи до объекта! Celtic tradition, and eastern and western symbolism. representing Rembrandt, Vincent van Gogh, Leonardo Da Vinci, Goya and Delacroix look out over the flat countryside of the Mayenne département in north-west France. And nearby, framing a broad avenue, statues of other historical and cultural giants – Joan of Arc, Picasso, Gaugin and Toulouse Lautrec – lead directly to the dragon’s lair. The eccentric Tatin Museum, near the small town of Cossé-le-Vivien, is an extraordinary homage to art, architecture and creation. 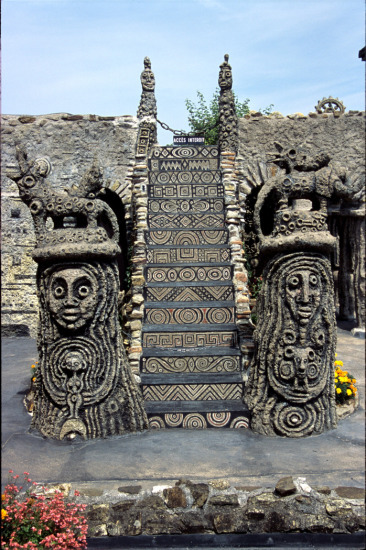 Begun in 1962, when artist Robert Tatin was already sixty, the museum features a walled enclosure and hidden courtyard, combining architecture, painting and sculpture within a diverse cultural symbolism. Tatin’s work has been called surrealist and naïve, fantastic and cosmic. During the building of his monumental courtyard Tatin drew inspiration from eastern mysticism, notably Taoist notions of the duality of human nature. Celtic, Aztec and Hindu symbols also add to a complex and detailed tableau including twelve sculptures around a cross-shaped basin representing the months of the year. Central to Tatin’s universe is the main courtyard and pool surrounded by three temple-like structures dedicated to the sun, earth and moon. The tallest structure, directly opposite the entrance, is a towering Celtic-inspired totem, or menhir, 6.5 metres high, ‘Notre-Dame-de-Tout-le-Monde’, Our Lady of Everyone, with a star of the three wise men carved at its base. female principles which shape the world. On the tympanum between the two symbolic figures is a huge abstract sun whose rays split into hundreds of shapes with human features. 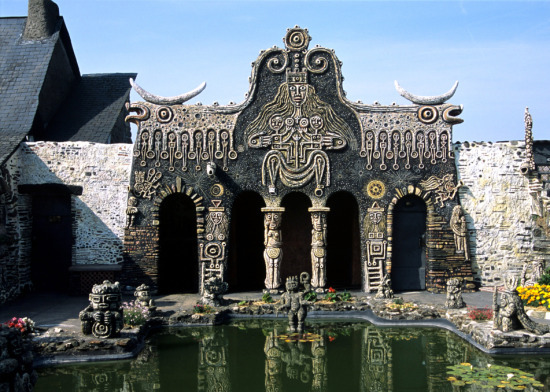 Opposite the sun gate, reflected in the cross-shaped pool, stands the Gateway of the Moon, with its undulating roofline and almost Picasso-like bulls on the ridge. Above the arches a crouching goddess, the ‘muse of unity’, holds a boy and girl to her breasts. Her feet rest on geometric symbols of imagination and reason: the circle and the square. The complex symbolism incorporated into Tatin’s museum drew on a lifetime of adventure and discovery. Born in nearby Laval in 1902, the young Robert was influenced by itinerant circuses which passed through the area each summer. He admired the lively paintings on the roundabouts, the wooden horses, the trapeze acts and the clowns’ repertoire. Such playful images reappeared years later in some of his adult paintings. 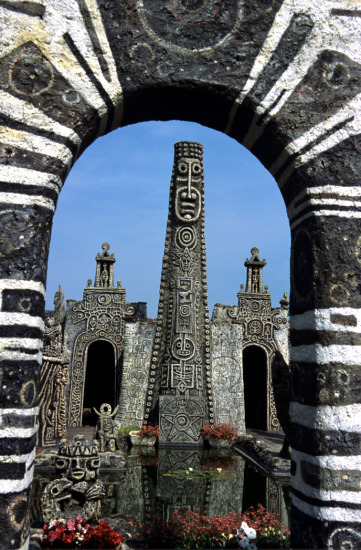 As a student Tatin discovered the megalithic monuments of Brittany - recreated in Cossé-le-Vivien in the Notre-Dame-de-Tout-le-Monde totem – and served an apprenticeship as a house painter and decorator. At sixteen he moved to Paris, before heading off for Switzerland, Italy, New York, Ireland, England and North Africa. After the Second World War he worked briefly as a ceramist in Paris, where his work caught the attention of Jean Debuffet. In 1950, however, the footloose artist headed to south America to spend five years travelling in Chile, Argentina and Brazil, where he received first prize in the Sao Paulo’s first Biennale. 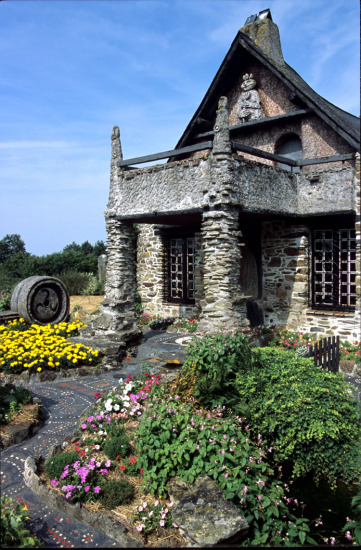 After his return to France in the late fifties, he purchased the stone farmhouse ‘La Frénouse’ which he began to transform into his chef d’œuvre in 1962. Tatin conceived the Frénouse as a bridge between east and west, where the sculptural architecture combines the influences of different cultures including Aztec, Hindu and Celtic symbolism, Chinese philosophy and surrealism. 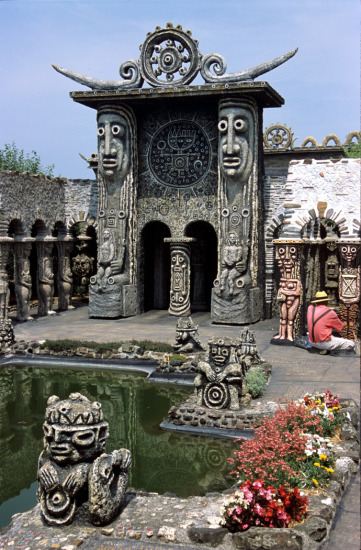 By 1969, the celebrated novelist and French culture minister, André Malraux was so impressed by Tatin’s work in Cossé-le-Vivien that he designated the courtyard, its adjacent buildings and structures, a national museum. In the strongly symbolic work Tatin not only paid homage to artistic genius and diverse cultures, but also related the story of his life in the 80-metre-long Avenue of Giants. The figures begin with statues of Gallic king Vercingetorix and Joan of Arc, national heroes familiar to all French school children, and which Tatin would have learned about in his first history lessons. Then come representations of the verbs ‘to have’ and ‘to be’, followed by a bearded carpenter evoking the period of his life when he worked as a craftsmen. Finally, his major artistic influences and reference points – Rousseau, André Breton, Gaugin, Picasso and Jules Verne among others – lead down to his concrete fortress and the culmination of his life’s work. 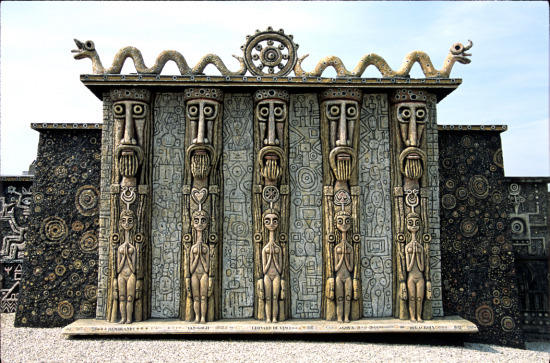 More than twenty years after Tatin’s death his monumental sculptures and buildings have changed little. 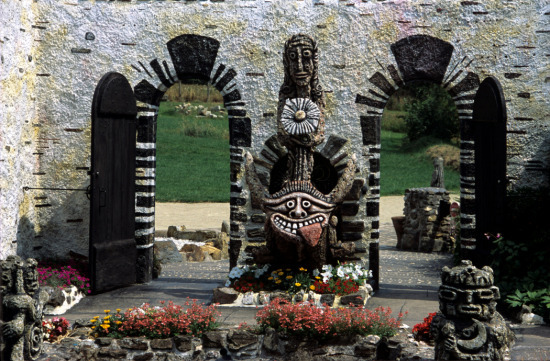 In Mayenne’s damp climate, however, some of the painted sculptures are beginning to fade. With its ongoing restoration programme and revenue from ticket sales Tatin’s cosmic legacy seems assured. Despite its distance from main tourism areas the eclectic museum receives a regular stream of summer visitors, eager to enter the surreal universe of one of France’s lesser-known symbolists.